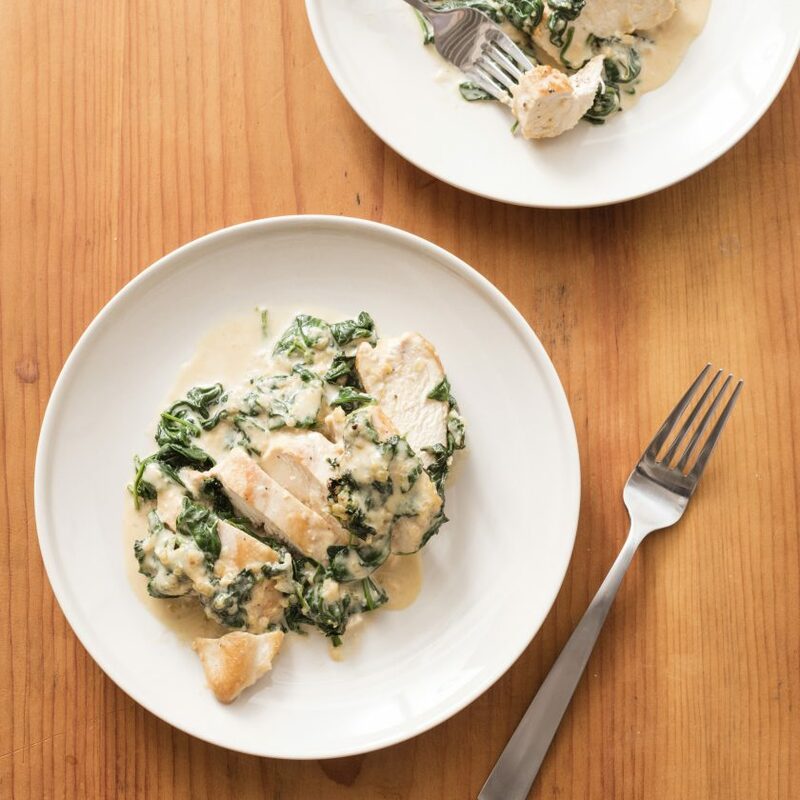 Chicken Florentine is a buffet-line favorite featuring chicken breast and spinach in a mild cream-and-Parmesan sauce — sometimes stuffed inside, sometimes stacked on top. All of these components are good, but this dish can often be stodgy (think old-fashioned casserole) or fussy (involving dredging chicken in flour and sauteeing). We wanted a simplified recipe for an elegant dish with clearer, brighter flavors. Braising was the perfect technique to achieve this: For flavor, we seared the chicken breasts first, cooked aromatics and added our cooking liquid (a balanced mix of water and chicken broth enriched with a modest amount of cream), and then simmered the chicken in the reducing sauce until perfectly cooked. After we topped the tender chicken with some sauteed spinach and the cream sauce, it needed just a quick run under the broiler to become appealingly golden on top. We like tender, quick-cooking bagged baby spinach here; if using curly-leaf spinach, chop it before cooking. Adjust oven rack to upper-middle position and heat broiler. Heat 1 tablespoon oil in 12-inch skillet over medium-high heat until shimmering. Add spinach and cook, stirring occasionally, until wilted, 1 to 2 minutes. Transfer spinach to colander set over bowl and press with spoon to release excess liquid; discard liquid. Cut breasts crosswise into 1/2-inch-thick slices and arrange on broiler-safe platter. Scatter spinach over chicken and pour sauce over spinach. Sprinkle with remaining 2 tablespoons Parmesan and broil until golden brown, 3 to 5 minutes. Serve. Nutrition information per serving: 334 calories; 208 calories from fat; 23 g fat (11 g saturated; 1 g trans fats); 128 mg cholesterol; 400 mg sodium; 5 g carbohydrate; 2 g fiber; 1 g sugar; 25 g protein.